In this photo taken Sept. 16, 2016, a young girl holds a child at a UNICEF clinic for severely malnourished children in Aweil, South Sudan. The head of the U.N. Mission in South Sudan (UNMISS) says the government there should make sure that aid agencies can reach people who are starving. On Monday, three U.N. aid agencies declared famine exists in two counties of South Sudan. UNMISS chief David Shearer said the government was still blocking aid by delaying paperwork that allows agencies to distribute relief items. In addition, he said, soldiers have erected several military checkpoints approaching famine-stricken areas. Shearer said that in recent days he'd had to intervene on behalf of UNMISS workers who were trying to access places where people were starving. He said the government blocked the mission from reaching Wau Shiluk when the U.N. wanted to assess humanitarian conditions in the area. Shearer said peacekeepers were also blocked from traveling to Kajo-Keji County of Yei River State, where fighting between government and the armed opposition forced hundreds of civilians to flee into the bush. "I would be delighted if we were able to see a reduction in a number of those violations and to say to the security council the situation is getting better," Shearer said. "I think that will be positive on both sides — on the government and U.N. side. I would like to see a greater degree of compliance with the agreements that have been signed some time ago." President Salva Kiir and SPLA-IO leader Riek Machar agreed to allow unfettered access to aid workers and peacekeepers to all areas under their control in previous cease-fire agreements. South Sudan Deputy Information Minister Akol Paul Kordit said lawmakers of the Transitional National Assembly had yet to draft "practical measures'' to ensure that aid agencies were not blocked from reaching people in need of help. "The parliament shall convene another session to discuss the speech of the president, and once the speech is discussed, the parliament shall then form or refer the speech to specialized parliamentary committees, whereby sections of the speech, including that of easing the access to humanitarian organizations, will be addressed by relevant parliamentary committee," Kordit said. Shearer said the government's process of issuing clearances for UNMISS officials entering South Sudan was tedious and overly bureaucratic. The South Sudan government signed a "status of force agreement" with the United Nations in 2011 that allows the U.N. to deploy peacekeepers in the country and guarantees freedom of movement for U.N. peacekeepers. The UNMISS chief said the mission was still waiting for the government to approve the visas of additional peacekeepers deployed to South Sudan. "There are some problems within the bureaucracy of the government, which is not allowing them to be able to get into the country," Shearer said. "This is a real problem and it interferes with our effective operation of our forces." On Tuesday, Kiir said his government would ease access for humanitarian aid agencies, but he did not elaborate. 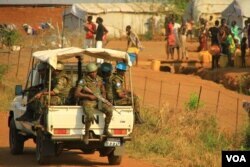 Kordit said the government would look into the complaints from UNMISS. "We will look into this and assess and examine it, and once truth is found in it, then the government will definitely take appropriate measures," Kordit said. Aid agencies say time is running out because heavy rains are expected to hit parts of the country over the next few months, making it difficult to distribute aid in areas most affected by the famine. Nicolas Peissel, a South Sudan project coordinator for Médecins Sans Frontières (MSF), also known as Doctors Without Borders, said medical aid workers still struggle to reach people in need. He said it's become impossible for MSF to open new hospitals or clinics, or even refer patients to other health facilities for care in parts of Unity State where famine was declared, due mostly to insecurity. FILE - Agop Manut, 11 months, who suffers from acute malnutrition and respiratory distress, is assisted at the clinic run by Doctors Without Borders (MSF) in Aweil, South Sudan, Oct. 11, 2016. "In the past few weeks, we have encountered extremely high levels of malnourishment above the yearly expected rate and we have set up an emergency intervention to provide health care to malnourished children in those counties of Maynedit and Leer," Peissel said. MSF has identified high levels of malnutrition in Dablual and Mirniyal in northern Mayendit county. 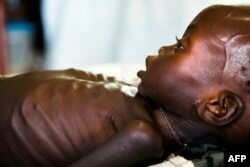 Peissel said a quarter of patients under age 5 had global acute malnutrition and at least 8 percent had severe acute malnutrition. Deepmala Mahla, a South Sudan country director for Mercy Corps, a global humanitarian organization, said aid agencies could save lives and stop the famine from spreading if they received more money for food assistance and medicine. But she added that humanitarians would have to come up with other ways to respond to long-term recovery assistance. "For example, we give a family or a village food supplies or food rations for a few weeks. That is not sustainable," Mahla said. "In addition to that, we can help them plant vegetables or a staple crop so that they have a safety net or something to keep the family going on. And these sorts of relief efforts, if they are compounded with recovery, then we can think of a sustainable future where this population will not stay in cyclical problems of food insecurity, but stay out of it." On Wednesday, Britain announced a new support package for Somalia and South Sudan. International Development Secretary Priti Patel said $125 million would go toward relief work in Somalia and another $125 million for humanitarian work in South Sudan.